Preliminary program for the 2012 AASLH Annual Meeting in Salt Lake City. In addition, most of the other sessions are helpful, depending on your needs and interests. There are sessions on fixing poorly functioning boards, public-private partnerships, visitor research, small museums on Main Street, programming for young children, identifying fraternal objects, adopting new technologies, and using Nomenclature 3.0. There are typically ten sessions running concurrently over three days and often you’re caught trying to decide among two or three sessions that occurring at the same time. On top of this, there are the meals for special interest groups (this year, the Historic House Breakfast will be joined by the newly formed Visitor Voices group) and training workshops. The meeting usually hosts a notable historian and this year is no exception with Laurel Thatcher Ulrich, the award-winning author of Good Wives, A Midwife’s Tale, and The Age of Homespun. Re-imagining Historic Sites: Three Roads to the Same Destination on Friday October 5 at 10:45 am. Much of my consulting work has focused on historic house museums that are experiencing declining support and looking for ways to turn things around. The direction isn’t always clear or obvious, and even if you know the steps you need to take, there’s a hesitancy due to the risk. In this session, I’ve brought together three different historic sites–Morris-Butler House, Haas-Lilienthal House, and the Courthouse at Colonial Williamsburg–to demonstrate various strategies, methods, and tools to help people get started. Speaking will be preservation architect Barbara Campagna, visitor research consultant Conny Graft, and historic site manager Gwendolen Raley. Following their presentations, I’ll lead an audience discussion to identify some common strategies for success (and how to measure it) and identify ways to develop a plan of action for their organization (and what to avoid). Meshing Mission and Community: Identifying Strategies for Engagement on Saturday, October 6 at 9:00 am. Community engagement has become an important aspect in state and local history as a strategy for increasing impact, gaining support, and becoming relevant. The challenge for most organizations is that engagement can be so daunting and difficult, they don’t know where to begin, how to prioritize among several good ideas, or how to measure success. This session will draw on the experiences of three very different history organizations whose work in community engagement is not well known in the field yet offer exemplary case studies to examine useful strategies. This session will start with a typical panel describing their experiences but then be followed by an audience discussion to identify the approaches that succeeded (and failed) and what elements needs to be modified to meet the organization’s mission and community needs. Joining me will be Deborah Schwartz, president of the Brooklyn Historical Society; Lorraine McConaghy, historian at the Museum of History and Industry; and Rachel Desgrosseilliers, executive director of Museum of Lewiston-Auburn (Maine). Historic House Museum and Visitor Voices Breakfast on Friday, October 5 at 7:00 am (thank heavens I benefit from the time change). Conny Graft and I will be sharing a presentation on the surprising outcomes from visitor research at historic places (and our goal for that hour of the morning is to keep it light, fun, and short). 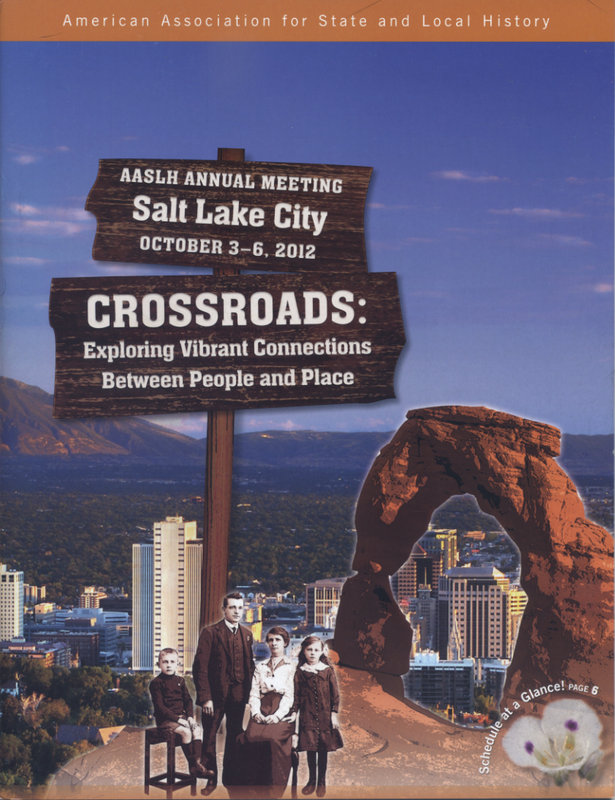 This year’s AASLH conference will be held from October 3-6, 2012 in Salt Lake City, Utah. Registration is $430 but if you’re a member and register by August 17, it’s only $225 (and for fulltime students, it’s only $175). If you didn’t receive a program in the mail, you can find it online as a pdf at http://aaslh.org/am2012.htm. This entry was posted in Training and tagged American Association for State and Local History on July 10, 2012 by Max van Balgooy.